All our professionals at MacEwan Dental Centre maintain the highest levels of accreditation and pursue ongoing education to stay abreast of the latest trends in dentistry. 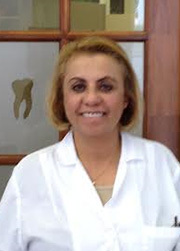 Dr. Shatha Dabagh has been practicing dentistry for over 25 years. She always makes it her priority to get to know her patients on a personal level to help put them at ease. She ensures that her patients always receive the best quality of care by attending continuing education seminars on a regular basis. Dr. Dabagh has been at MacEwan Dental since 2007 and has also worked with Calgary Health Region for over two-and-a-half years. She has also worked in Northeast Calgary, Southwest Calgary, and Red Deer for a decade. In her spare time, Dr. Dabagh loves to travel, swim, and keep up with the latest innovations in forensic science. She looks forward to meeting you to help improve your smile! 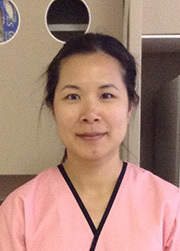 Mei obtained her dental assistant certificate from Columbia College and has been working at MacEwan Dental since October 2011. She strongly believes in educating her patients about their treatment and pays close attention to their needs to ensure that they are comfortable at all times. In her spare time, Mei enjoys doing Pilates, reading about health and fitness, and sampling different types of cuisine around town. Sony is the newest member of MacEwan Dental . She has her Bachelors in Nursing and is fluent in English ,Hindi and Malayalam. In her spare time, Sony enjoys watching sports and shopping online. Feel free to tell Sony any concerns you have when you book your next dental appointment.